Friday evening, Buenos Aires. A group of people are gathered round a table at a vegetarian supper club in the San Telmo neighbourhood. On the menu are three courses: beetroot gazpacho, Moroccan tagine and strawberry cheesecake, all made from fresh ingredients. It’s a great opportunity to meet new people, indulge in healthy food – and bond over the cause that brought them here. Delicias de Alicia, based in the Argentinian capital, is a vegetarian pop-up restaurant and catering service. All the meals are cooked by one chef, Alicia Amende, and profits are re-invested into nutritional cooking workshops for children in low-income communities. Amende began taking fresh ingredients to communities – areas that often lack adequate sanitation or sufficiently insulated homes – and cooking with children there once a week. 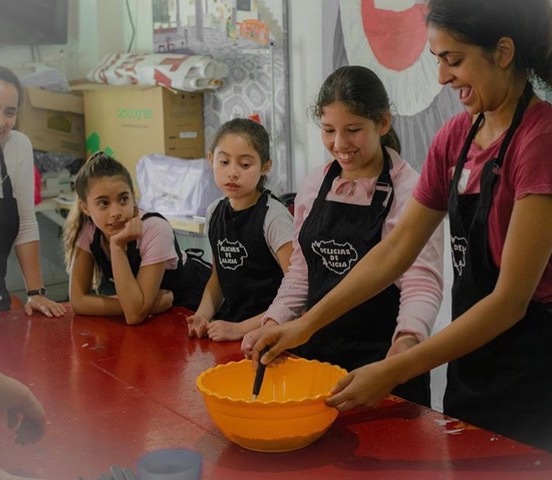 By 2015, Delicias de Alicia was born, bringing teams of volunteers to run workshops in these areas.They buy ingredients locally, and teach 8 to 12-year-old children about different food types as they make recipes together over a six-week programme. In the three and a half years since it was founded, Delicias de Alicia has reached over 250 children in six different communities. There’s also a lack of information on healthy eating for families in Argentina, Amende continues, and most people assume it’s expensive. Rising food prices and a declining currency don’t help – but this is what Delicias de Alicia tries to dispute. By buying the food locally on a small budget, the team shows that it is possible to maintain a healthy diet affordably. They educate people about nutrition and its value in a fun, creative way. 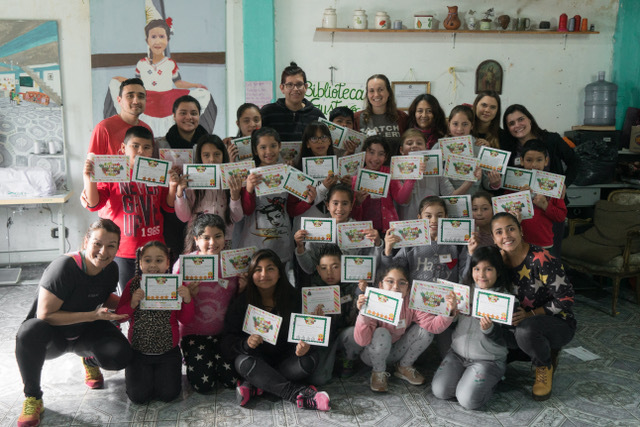 Gisel Bogado, an Argentine volunteer who recently graduated with a degree in nutrition, explains why teaching children about healthy habits and cooking can be so beneficial. “Promotion of a good lifestyle and prevention of a bad one ismost effective at this age,” she says. There’s another way the organisation is trying to make an impact. Argentina is the second largest meat-consuming country in the world, and the average citizen consumed 118kg of meat last year. High levels of red meat consumption can lead to increased risk of heart disease, diabetes and premature death; meat production is also hugely concerning for the environment – beef can give out up to 105kg of greenhouse gases per 100g. Delicias de Alicia is proving that vegetarian alternatives can be tasty, affordable and healthy. Supper clubs currently take place once a month, with the catering service available on request; so far, Delicias de Alicia has provided services from wedding cakes to catering for up to 350 people. Since March this year this has brought in about 53,000 Argentine pesos (around £1130 at current exchange rates). The social enterprise faces ongoing challenges, from entering precarious communities which may put staff and volunteers at risk, to finding suitable places to deliver workshops (particularly during extreme heat in summer, or flooding in the winter). Generating more paying customers is also a challenge, especially in the current economic climate. But it's essential, as we don't get any other funding, apart from donations of fruit and vegetables. Delicias de Alicia delivers one workshop every Saturday, but the long-term goal is to host two in parallel and double the number of children reached. To finance this (it costs £240 to deliver a six-week programme for 30 children) the team needs to host more dinners and supply more catering services. Currently, all dinners (charged at 580 pesos, or £12.40 per person) take place in a house in downtown Buenos Aires, which lacks the necessary space and equipment to host larger dinners, so the first step is to rent a professional kitchen space. But with all profits needed to keep running the children’s workshops, there is very little left over to reinvest into longer-term growth. Delicias de Alicia is therefore hoping to raise enough for a kitchen, which would cost around £8,000 for a year, through crowdfunding. As a student who began my social enterprise journey in Edinburgh working for a student-led consultancy, I fell in love with the power of making tangible change. While jobhunting in South America, Delicias de Alicia felt like the natural step forward. The organisation brims with big minds and bigger hearts. Social investment, whether with your time or your money, is powerful and life-affirming. The author is a former student consultant at FreshSight and a French and Spanish undergraduate at the University of Edinburgh, currently volunteering with Delicias de Alicia. Photos: beetroot gazpacho starter; Rhia Patel helping children to make healthy banana muffins; children 'graduating' after a six-week programme.